Our main task this week has been planting garlic, both hardneck and softneck. As we separated the cloves for planting, we put all the tiny cloves (which wouldn’t grow big bulbs) into small buckets. We use these to grow garlic scallions. Planting them is next on our list. 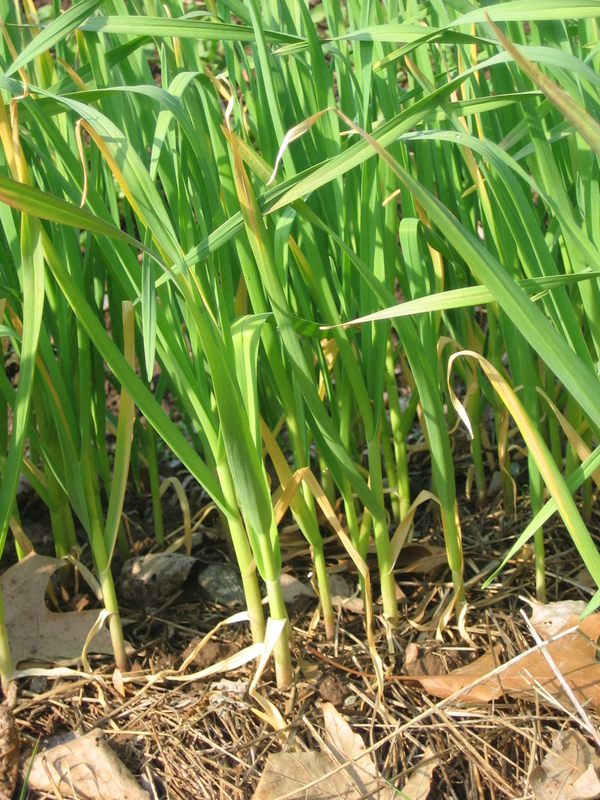 Garlic scallions are small whole garlic plants, pulled and bunched in the spring like onion scallions. They are chopped and cooked in stir-fries and other dishes. They are mostly green leaves at that point, although the remains of the clove can also be eaten. Hard-core garlic lovers eat them raw like onion scallions. They provide an attractive early spring crop. To grow garlic scallions, plant small cloves close together in furrows, simply dropping them in almost shoulder to shoulder, any way up that they fall. (If you’ve just finished a large planting of main-crop garlic, you’ll probably be too tired to fuss with them anyway!) Close the furrow and mulch over the top with spoiled hay or straw. You could plant these next to your main garlic patch, or in a part of the garden that’s easily accessible for harvest in spring. Or you could plant your regular garlic patch with cloves at half the usual spacing and pull out every other one early. Think about quantities, though. If we double planted, we’d have over 7000 scallions, far more than we could use. The danger with double planting is stunting the size of your main crop by not thinning out the ones intended for scallions soon enough. 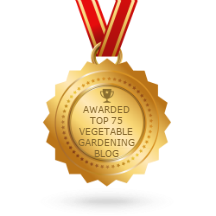 We plant our small cloves for scallions at one edge of the garden, and as we harvest, we use the weed-free area revealed to sow the lettuce seedlings for that week. With a last frost date of 20-30 April, we harvest garlic scallions from early March until May, depending on how long our supply lasts out, and when we need the space for something else. 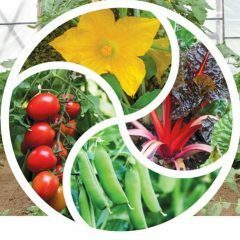 Harvesting is simple, although depending on your soil, you may need to loosen the plants with a fork rather than just pulling. Trim the roots, rinse, bundle, set in a small bucket with a little water, and you’re done! Some people cut the greens at 10″ (25 cm) tall, and bunch them, allowing cuts to be made every two or three weeks. We tried this, but prefer to simply pull the whole plant once it reaches about 7-8″ (18-20 cm) tall. The leaves keep in better condition if still attached to the clove. Scallions can be sold in small bunches of 3-6 depending on size. If you do have more than you can sell in the spring, you could chop and dry them, or make pesto, for sale later in the year. 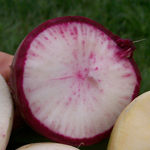 Shunkyo Semi-long (32 days, OP), 4-5″ (10-12 cm), smooth, cylindrical, attractive rose-pink roots with crisp white flesh. The flavor is hot and sweetly nutty. The pink-stemmed leaves can also be eaten. This slow bolting variety can be sown throughout the year in mild climates. The other varieties in this list are all day-length sensitive, for summer to fall sowing only. They bolt if sown in spring. China Rose (55 days, OP). AKA Rose Colored Chinese, Scarlet China Winter. About 5″ (12 cm) in diameter. Round, with white flesh, pink skin. Cosmetically, this variety is more variable and less beautiful than Shunkyo. Red Meat (50 days, OP). AKA Watermelon. Large round roots, 2-4″ (5-10 cm), depending on how long you let them grow. Green and white skin, with sweet dark pink flesh. Large leaves. Misato Rose (60 days, OP). AKA Chinese Red Heart. Green and white skin, rose and white “starburst” flesh. Beautiful when sliced for salads. Unlike many radishes, this one will still bulb properly if crowded, according to Southern Exposure Seed Exchange. Attractive, spicy, not sharp, with “a rich sweet vegetable undertone.” Can grow as large as a big beet if given sufficient space. A good keeper. Shinden Risoh Daikon (65 days F-1 hybrid). 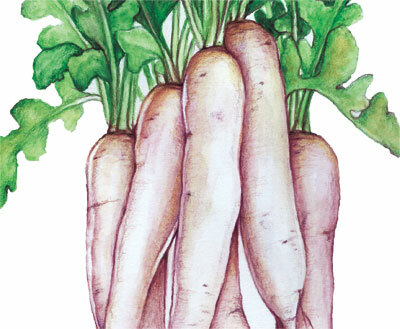 Daikon (pronounced “dye-kon”) is the Japanese word for radish. Daikon are huge long white roots which store very well and stay crisp for months under refrigeration. They can be grated or sliced thin for salads, pickled, or sliced and chopped for stir-fries. Kim Chee is a traditional Korean pickle made with daikon and napa Chinese cabbage. Daikon can also be harvested small. Miyashige Daikon (50 days, OP). 16-18″ (40-45 cm) long by 2.5-3″ (6-8 cm) in diameter. These “stump-rooted” cylindrical white radishes are pale green near the crown. Very crisp and tender for pickling and storage. This year we grew 45′ each of Shunkyo Semi-Long, China Rose, Red Meat and Shindin Risoh Daikon. In terms of yield, the China Rose is the clear winner: 54 lbs from 45′. And they look very smooth and attractive. 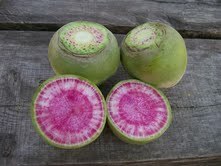 Next best in yield was the other pink one, Shunkyo Semi-Long at 25 lbs. The daikon came in at 21 lbs, lower than I expected. Maybe we should have thinned more drastically. A big disappointment was the Red Meat at only 15 lbs. Mind you, this one sells itself on its impressive looks. See the picture above. Next Next post: Where in the world?